It was until now believed that nocturnally migrating songbirds, while venturing into the unfamiliar night sky for accomplishing their long, challenging trans-continental migrations, could at least release anti-predator vigilance thanks to the concealment of darkness. A new study by Spanish and Swiss scientists – published this week in PLoS ONE – shows that migration at night is not without predation risk for passerines. A unique creature is indeed capable of exploiting the formidable food source represented by the billions of high-flying, Eurasian songbirds which engage twice a year into long-distance, north-south or south-north nocturnal movements. The danger seems especially acute where birds' flight routes converge around the Mediterranean basin, such as the Iberian Peninsula. This newly recognized hazard adds to the numerous obstacles that sea and desert crossings already represent for fragile migratory passerines. Actually, the newly uncovered danger comes from the deep black sky, in the form of a 45 cm wing-spanned aerial-hawking mammal, equipped with sharp canines and an efficient radar system which remains probably largely inaudible to songbirds. In 2001, Carlos Ibáñez and his colleagues at the Doñana Biological Station in Seville, Spain, suggested that the giant noctule bat (Nyctalus lasiopterus), a rare European species occurring principally in the Mediterranean, may feed to a large extent on birds (Proceedings of the National Academy of Sciences 98, 9700-9702). They had found numerous feathers in the faeces of Spanish giant noctules, with occurrence peaks in the diet in spring and autumn, i.e. during main songbirds' seasonal migration. This contrasted strikingly with food composition of other European bat species which all feed exclusively on invertebrates! This finding brought about a heated controversy among bat scientists. Some claimed that eating feathers was no proof of preying upon birds: they suggested that giant noctules could simply, and accidentally, ingest feathers hovering in the air, which are particularly numerous during migration events. According to the detractors of a bird-based diet, eating feathers could thus be a classical consequence of a bats' echolocation system which hampers fine-grained discrimination of targets (therefore a confusion between insect prey and feathers); also, the costs of swallowing feathers which are casually encountered would be lower than spitting them away (Bontadina & Arlettaz, 2003 Functional Ecology 17, 141-142). In the case of giant noctule bats, it was for sure the description by Ibañez et al. (2001) of a so far totally unrecognized, outstanding predator-prey relationship that triggered so much initial scepticism. As usual, a new major and amazing discovery generates a lot of sceptical reactions, which calls for gathering further, indisputable scientific evidence. Indeed, presence of feathers in diet was no ultimate demonstration of a bird-based diet, although indicative. New innovative approaches were thus necessary for proving the case. But how to study the foraging habits of an elusive predator that chases its favourite prey several hundreds if not thousands of metres above the ground in total darkness? 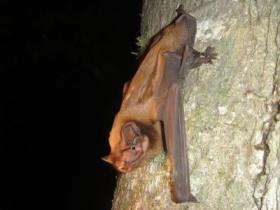 To elucidate the mysterious habits of giant noctule bats, an ambitious investigation led by young scientist Ana Popa-Lisseanu, under Prof. Ibañez' supervision, was launched by Spanish research teams based in Sevilla (Doñana Biological Station) and Granada (Zaidín Experimental Station) thanks to funding from the Spanish Environmental Ministry. The programme was soon joined by one of their once most virulent Swiss detractors (Prof. Raphaël Arlettaz, University of Bern and Swiss Ornithological Institute). The technique of stable isotopes was applied because this recently developed method allows tracking species' main dietary specializations and trophic level position along food chains. The researchers concentrated on carbon and nitrogen isotopes, which are among the best dietary tracers. They analysed their concentrations in bats' blood throughout the year, predicting major seasonal shifts in isotopic signatures towards bird prey in spring and, especially, during autumn. In parallel, isotopic signatures of whole insect bodies and passerine muscular tissues were tracked throughout the year, serving as a control. The results elegantly showed that the bats ate only insects in summer, included some songbirds' flesh in their diet during spring, and depended a great deal on passerines during autumn. Moreover, a higher fraction of songbirds' flesh in autumn than in spring was attributed to the more massive passerine migration in autumn, because both parents and offspring migrate then towards their wintering grounds in Africa, whereas in spring only birds having survived winter mortality return to their breeding area. In addition, young birds in autumn may represent naïve, inexperienced, i.e. more vulnerable prey. The ability of giant noctules to prey on the wing upon nocturnally migrating passerines appears unique not only among bats but also within the whole animal kingdom. Although carnivorous bats feeding on small-sized vertebrates are not rare, they all live in the Tropics and collect their prey from substrates. The few species of falcons which capture migratory birds along the Mediterranean and African coasts are exclusively diurnal. Finally, owls, as typical night-active predators, never forage in the open space: moving prey is detected from substrates through passive-listening of rustling noises. The unique ecological niche of the giant noctule may in turn explain some of its peculiar natural history traits. First, the species occurs almost exclusively in some restricted parts of the Mediterranean where major streams of migrating birds congregate. Second, it is among the largest Palaeartic bats and even belongs to the heaviest aerial-hunting bats of the world. A large body mass (up to 50 g for 45 cm wingspan) is probably a prerequisite for subduing prey items as large as passerines, which have approximately the same weight as other European bat species. The extraordinary predatory specialization of the giant noctule may be shared by the few other big aerial-hawking bat species which exist elsewhere in the world. Are some of them similarly stalking unwary songbirds during their massive nocturnal passes? The foraging habits of these rare bats still remain quite mysterious, like in the case of giant noctules until recently. Stable isotopes could be a promising tool for unravelling their furtive ecology.